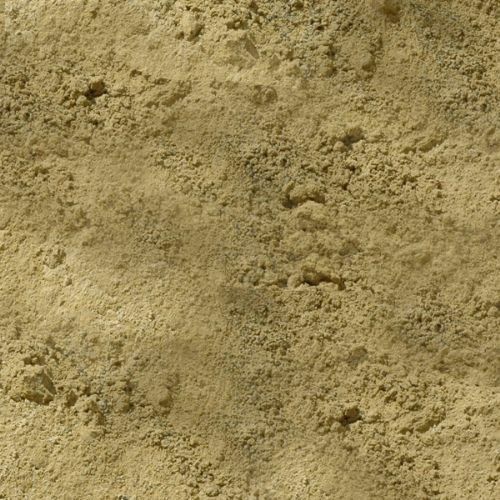 Greenvale Play Sand is a golden-coloured, fine sand which is ideal for many applications. Use it on playgrounds, golf courses, sports fields, and equestrian arenas. It is excellent around the garden and home. Greenvaleâs Play Sand is actually a Silica Sand. This fine sand is composed of primarily of Crystalline Silica which has been crushed into fine particles. Crystalline silica is a natural material which comes mainly from quartzâa common mineral. Quartz derived sand is used in many industrial applications including the making of concrete, bricks, and mortar. Workers around crystalline silica are advised to use masks because constant exposure to silica dust or any form of dust can cause serious lung disease; however, silica is safe for ordinary use such as on golf courses, sports fields, gardens, play areas, and horse arenas where a great deal of dust will not be produced. Crystalline silica sand makes an excellent drainage material which is why it is often used in golf bunkers and on sports fields. Silica Play Sand provides a soft surface for equestrian arenas; it is easy on the horsesâ legs. It does not contain a large among of clay so it will not compact into an overly hard surface like sands contain clay can. Silica Play Sand is also durable and resistant to crushing when stepped on; it will last many years in an arena when properly installed. When used for equestrian arenas it is often used in combination with chipped rubber. Equestrian arenas require a sub-base for drainage and level footing. Coarse aggregates such as 40 mm limestone are used for sub-bases. A moisture proof membrane lining is then put in place over the area . A 100â130 mm (4 to 5 inch) layer of silica sand should be laid on top of membrane. It should be compacted with a heavy-wheeled or track vehicle or a powered roller. Once compacted, it should be left to settle for about two weeks. A final finishing material such as chopped rubber can then be put into place over the sand. Chopped rubber is laid to a depth of 50mm (2 inches). Once the horses have been ridden on it for few days, it will need to be compacted again with an appropriate roller or motorized vehicle. This same procedure will be need to be repeated until the surface achieves the desired compactness. If leveling is needed, the horses can used to drag a bar gate over the surface. Greenvaleâs Play Sand is available in tonne bags (1000 KG), large bags (25 KG) and bulk.